While it sounds like it could be the title of a best-selling crime novel, 'Hounds on the Hudson' is not a sequel to Sir Arthur Conan Doyle's Sherlock Holmes classic, The Hound of the Baskervilles. No, HOTH is actually what one might think of as a five-star doggie hotel, inclusive of spa treatments. Kim PamperinTo understand what went into creating such an upscale daycare and boarding facility, one needs only to meet its owner and proprietor. With a name like Kim Pamperin, this entrepreneur might have been made for the "pampering" business early on! However, that was not the case. Serving 14 years as an advertising graphic designer for Toys 'R' Us, it took Pamperin a while to figure out she was not "cut out for Corporate America." Ask her why, and she will tell you, "I am terrible at office politics!" Her passion for dogs grew when she tried to make ends meet by dog-walking and pet-sitting in between freelance graphic designing gigs. With a passion for all things canine, it occurred to Pamperin that what dogs really needed was what she called a "one-stop dog care utopia." At that point, Hounds on the Hudson was the nucleus of an idea just ready to germinate. After being certified by the New Jersey's Entrepreneur Training Institute in the fall of 2004, Pamperin received funding from the New Jersey Economic Development Authority and UCEDC to commence construction on her new enterprise. To promote her business, she relied on the graphic designing skills she honed while working for Toys 'R' Us. "I have been able to save a lot of money when it comes to advertising because I can design my own ads and printed materials," notes Pamperin. 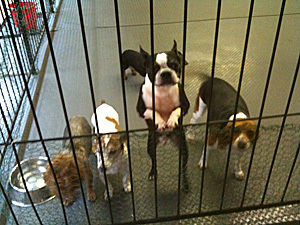 Today, her hounds' masters are attracted to her facility because of its full-service offerings. "Based in Guttenberg, New Jersey, our client base covers primarily Hudson, Bergen and Essex counties in New Jersey as well as the NYC metro area." When asked what the difference is in training puppies versus tweens, or older dogs, Pamperin was quick to point out that "of course it's easier with a blank slate like a puppy, but all dogs can be taught," and in training an older dog it often comes down to "trying to undo a bad habit. . .or teaching it commands it may never learned as a pup." Webcams are a service she offers pet owners gratis. "We view the cameras as one of the perks and an extension of our transparency philosophy. We believe it is an important part in building trust between us and our pet parents," states Pamperin. As far as the possibility of "no room at the inn," Pamperin says they accept a maximum of 40 dogs at any one time, "and around the big holidays, we do max out, with a waiting list." 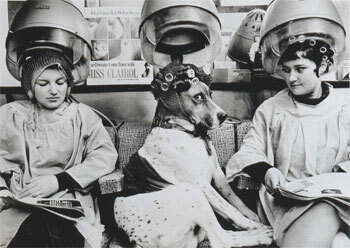 And if you think that spa treatments for dogs is just giving them a bubble bath, at HOTH, hounds are treated royally, with aromatherapy, hair cuts, manicures (erh, I guess that would be pedicures), ear cleanings, 'soothing' massages and even a brush and comb-out. For more on the Hounds on the Hudson, check them out at their website, on Twitter and at Facebook.